I am a huuuuge fan of all-white bedding. Partially because there are millions of cute duvet covers in the world and I could never choose my favorite, but mostly because sinking into an all-white bed at the end of the day feels like paradise. In our master bedroom, we've got white sheets, a white duvet and a white bed skirt (does anyone ever still call those "dust ruffles?" If not, we should start. That and "pocketbook" should definitely make a comeback). In the winter time, we opt for heavier weight sateen sheets but in the summer we use crisp white cotton sheets that are super cool and refreshing. 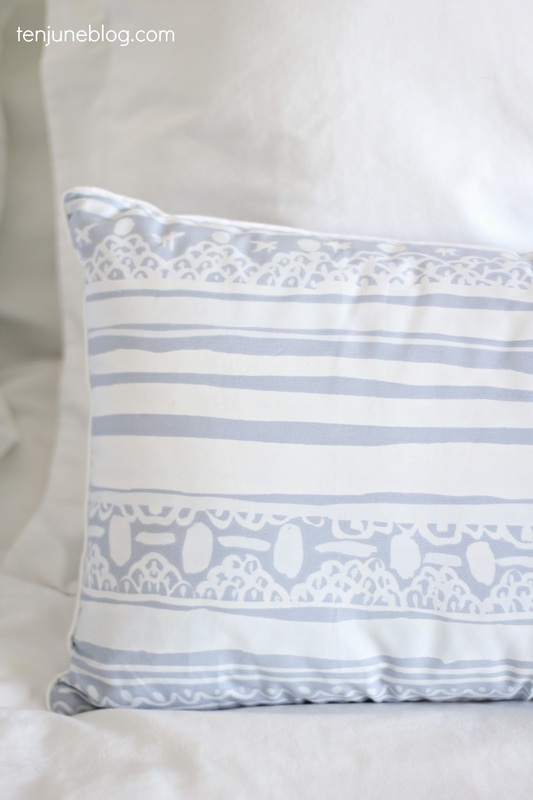 Needless to say, there's something to be said for a pretty pillow that can make me break my "all-white bedding" rule and I think these cornflower blue print pillows do the trick! The pillows are from Macy's partnership collection with the talented floral homegoods designer bluebellgray. This line has some amazing watercolor-esque floral pillows, bedding and other homeware designs. You can shop the whole collection here. 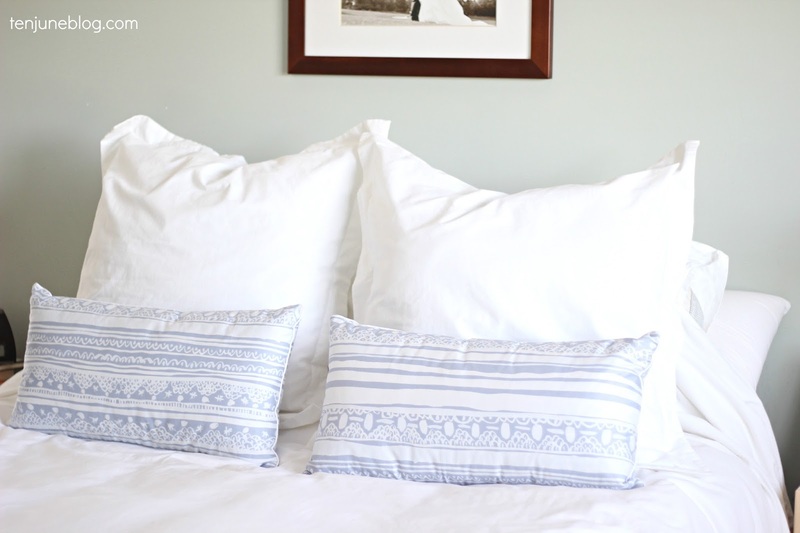 Also, I realize that Euro shams are typically placed in the very back of the pillows on a bed, but I saw Sarah Richardson stack the Euros in the front like this once and I thought, well, if she can do it, so can I! It's also the lazy girl's way to making the bed, just pull up the cover and smooth out the sheets, stack the head pillows and then cover up with the Euro pillows! Boom. ...no, we still have not painted those Ikea Rast nightstands that I picked up, oh, like five years ago. I did add some sweet knobs though, although somehow they've only ended up on David's nightstand and not mine thus far. It's like I've got two kids, a full-time job, a husband and I'm designing and building a house or something?! Knobs are the priorities, Michelle, get with it! 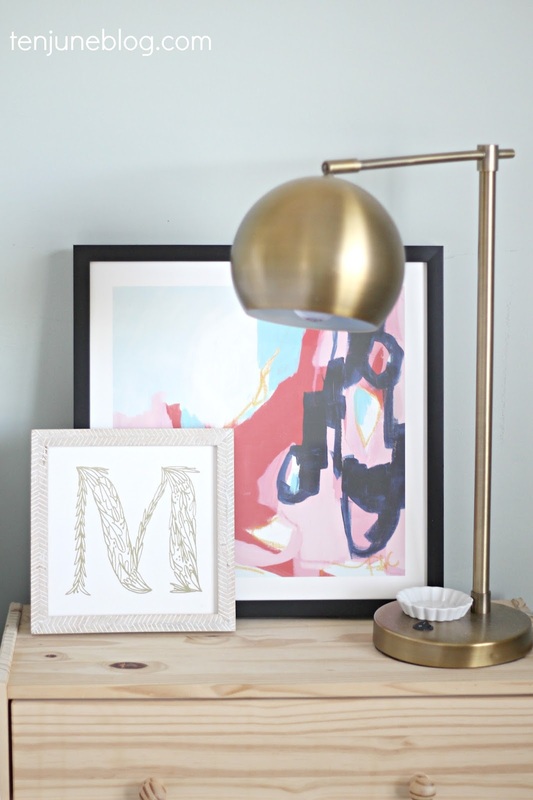 And the other side of the room is also in status quo, looking pretty and fresh with a white dresser, mixed metal elements and my favorite lamp ever. More on that space and vignette here. 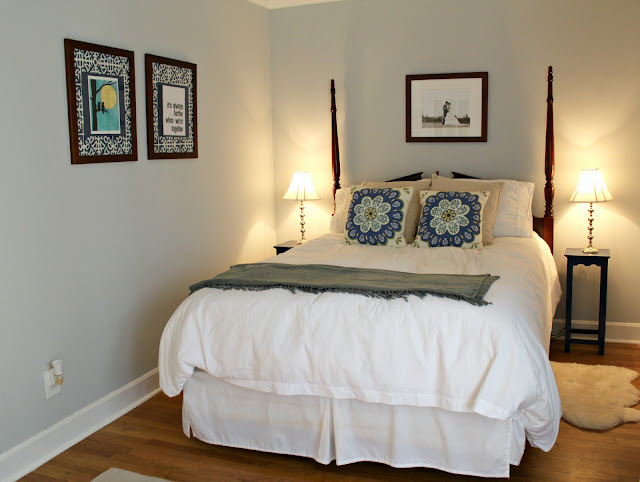 For a tour of the master bedroom at our last rental house check out this post. It makes me laugh that this temporary room (we were only there six months!) 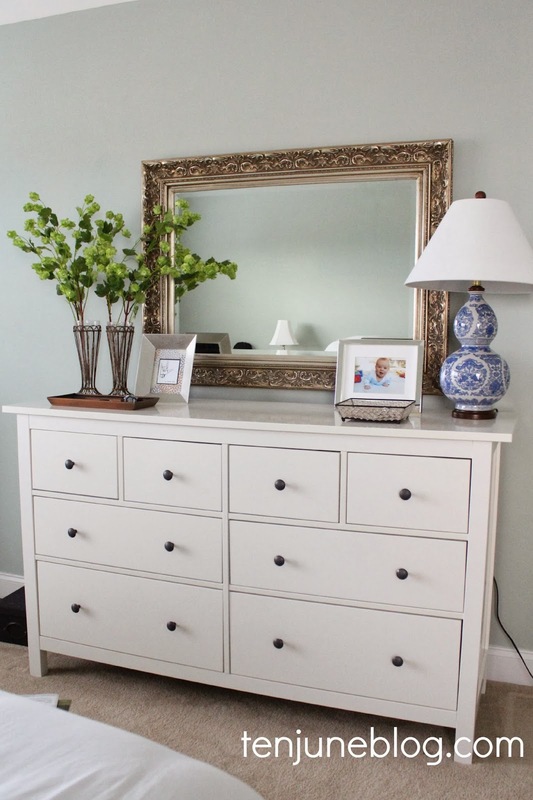 is a crowd favorite on Pinterest, but I guess there's something "real" about the room that people connect with. Or maybe it's just Tucker, he is pretty cute. 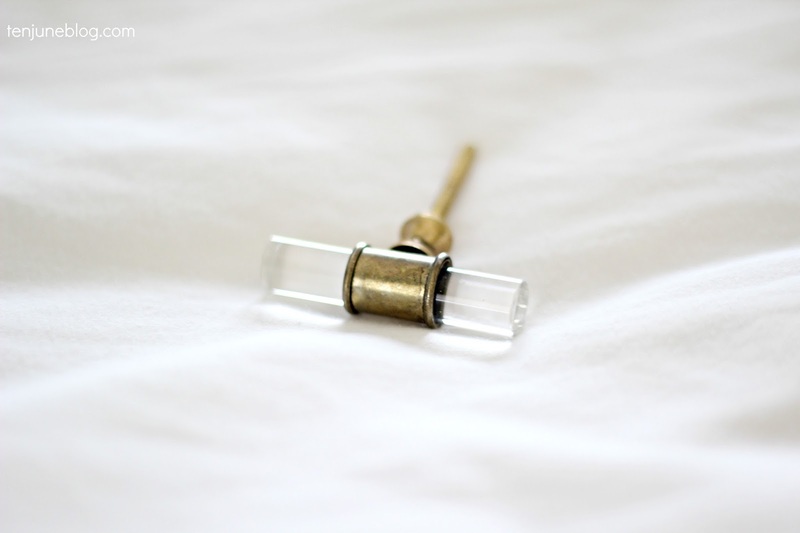 For a tour of our master bedroom at our first house, check out this post (warning, bullet holes are involved in this post) and this post. In fact, you can find the whole house tour for our first house- a 1952 ranch that we renovated!- right here. We love and miss that house! 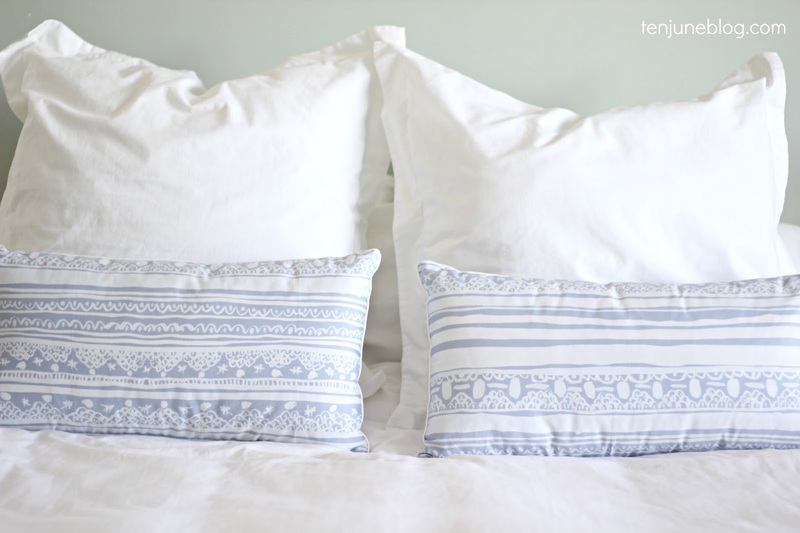 Thanks to Macy's and bluebellgray for sharing your pretty pillows! I love all white bedding! Those accent pillows are really gorgeous! I'm currently on the hunt for a upholstered linen headboard! 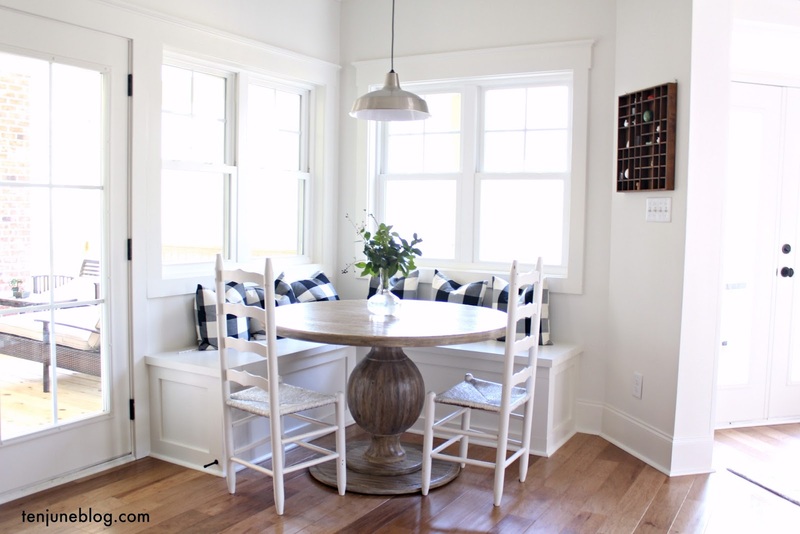 Ooooh, with nailhead trim or without? Keep me posted on what you find, that's the direction we want to go eventually! Did you check out Ballard and Home Decorators?